Pending withdrawals time limit is 24 hours. Withdrawal time frames vary from 0 to 5 days depending on the method used. LeoVegas celebrated its 7th birthday in 2019. As a pioneering trailblazer in the mobile casino industry, it can look back proudly of everything it has achieved in five years. It has an impeccable reputation among players and peers, a dedicated fanbase and a richly innovative approach to online gaming. It’s all come together to create a Swedish success story that continues to sizzle. But can LeoVegas keep up the momentum in such a crowded marketplace? LeoVegas’s mobile casino set the standard for others to follow. However, their groundbreaking ‘mobile first’ approach never caused the savvy design team to neglect the desktop site and the two platforms have existed in harmonious tandem for half a decade now. Both adopt broadly similar visual themes, with the company’s trademark orange framing the main site while the LeoVegas lion lords it over proceedings like a modern-day Aslan. They’ve created a strong brand identity that’s become increasingly well known, even outside of gaming circles. For such an innovative casino, the site design is for the large part quite traditional. It uses images of Las Vegas, a familiar games grid and easy navigation panes to help you find your way around. In truth, we’d never claim this to be the most attractive site in the world. The mobile site set a standard that others have now caught, while the desktop site appears a little cluttered in places. That said, the strength of the LeoVegas written content is never in question and neither is the user experience. These elements all add to its enduring, expanding popularity. You wouldn’t expect a complicated experience when registering with a casino-like LeoVegas – and you don’t get one either. You’ll be through the signup process on either desktop or mobile within minutes, they send you a verification code, let you pick your preferred bonus (casino, live casino, sports bonus or none at all) and finish you up on the deposit page. You can navigate back to the games grid in a click if you want to make yourself at home before depositing, or seek out Starburst so you can use your no deposit free spins. LeoVegas employ a full team of copywriters to look ensure that promotions, terms and games are all described in a lively, yet informative manner. Its content is amongst the best out there because of this and it reflects the positive, lively nature of the brand as a whole. The profile portal is easy to understand, there are quick links to live support and even password reset, as well as the cashier, games and promotions pages. Yes, we still think the site is a bit cluttered in places and could do with being simplified. But it doesn’t detract from the overall experience. LeoVegas is a piece of cake to use. Game providers will be clambering over themselves to ensure they are associated with a brand like LeoVegas. This has allowed them to build one of the most comprehensive selections of games in the industry, including 500 slots. The casino has a close affiliation with NetEnt so expect plenty of promotions featuring their gaming. They also count the likes of MicroGaming, Quickspin, Play n’ Go, Yggradsil and loads more amongst their number. Given the breadth of the choice available at LeoVegas, they could do with a few more filters and search options. We’re surprised they don’t have them in fact. You can’t search by provider, so get ready to browse. You can, however, head to different games categories, such as video slots, classic slots, table games or jackpots. The latter section features no less than 24 jackpot slots, all arranged in order according to the top prize on offer at the time. Genre-defining classics like Mega Moolah and Mega Fortune have made the cut, alongside a handful of other progressive jackpots and a large selection of locals. Finally, LeoVegas incorporates an expansive live casino with 40 different games hosted by real humanoids. Sometimes it feels like live casinos have been bolted on to online casinos but not so here. They even offer a bespoke welcome bonus for live casino aficionados, remember. If you opt-in for the standard LeoVegas free spins casino package, you’ll receive your 20 free spins without deposit when you register (available to UK players only). You’ll see the spins advertised during the signup process, although they don’t show in your profile module. 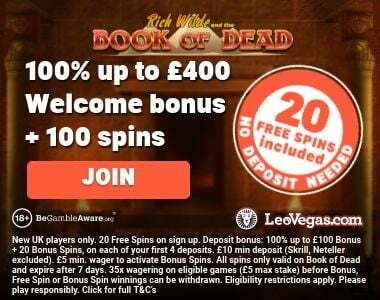 You’ll just need to load up Book of Dead, where you’ll find them waiting for you (LeoVegas once offered the free spins on a variety of games but have abandoned that for now). Leovegas is also a deposit bonus offer of 100% up to £400 plus 100 bonus spins. The bonus offer is over consists of a four tier deposit where you get up to £100 in cash and 25 bonus spins each time. There is also a Live Casino welcome bonus available to newcomers at LeoVegas. It shares the spotlight with a sports bonus and standard online casino bonus, the latter of which we will concentrate on here. It’s great to be given the opportunity to tailor your bonus according to your playing habits though. We will talk about the LeoVegas Live Casino and LeoVegas Sport bonus offers in our respective reviews. WHY BECOME A REGULAR PLAYER AT LEOVEGAS? LeoVegas is a purveyor of some of the finest, most tantalising bonus offers around. You can rely on the team to celebrate new game releases, showering players with free spins, cash bonus offers and frequently the chance to win much more. Some of their prize giveaways are legendary (such as their rock star package, which ushered in the arrival of Guns N’ Roses) and many others. You have to be in it to win it, just check the promotions page every time you visit. This online casino is renowned for sharing its success with its players, as should be the case. They invest heavily in customer service to provide 24/7 live chat coverage and a secure environment, which never shirks its responsibilities. 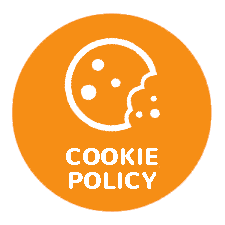 You even get prompted to set a maximum bet limit during registration – a nice indication of LeoVegas’s attitude to fair and safe gaming. It’s impossible to get this far into a LeoVegas review without mentioning their attitude to mobile gaming so we make no apologies for following the crowd. there is no Leovegas app, but they have developed their casino completely around mobile gaming. It’s remarkable to think that a ‘mobile-first’ attitude could be deemed groundbreaking these days, but that just shows how much the sector has grown. LeoVegas always has been synonymous with first-class mobile gaming and nothing has changed, even if their peers quickly cottoned on. You can expect a seamless experience when logging on from an Android smartphone, tablet, iPhone or iPad. The site loads in the blink of an eye, its quick and responsive to use and wonderfully designed. You get the same functionality you would expect from a leading desktop site including as many slots and table games as the team can cram in. If you are a keen mobile gamer, you should have no qualms about spinning your favourite slots at LeoVegas. Over the past few years we have done our fair share of Leovegas reviews. and we can safely say that only a handful of the best online casinos enjoy the sort of success that LeoVegas has achieved. Now listed on the Swedish stock market, this is now a genuine brand and continues to grow at pace. They attacked a developing niche in the market and it paid off handsomely but they also refuse to rest on their laurels. LeoVegas repeatedly shows a willingness to share success with its loyal user base through huge promotions and continued investment in the player experience. Having added a sports book and continued to expand its casino provision, it’s difficult to foresee anything other than continued fortune for the sight. You’d be well advised to see what all the fuss is about. The casino has a great selection of slots, table and live casino games to choose from. Almost all of the games are mobile friendly and ave been developed by by the top names in the business.